“Grand Ensemble” has two meanings in French: “large residential area” and “large orchestra”. French composer and sound artist Pierre Sauvageot takes the risk of connecting these two meanings together. The unusual placing of a classical orchestra on balconies makes unexpected orchestral effects possible: different floors communicate with one another, melodies travel from window to window, rhythms are interrupted by staircases, repeating from music stand to music stand. 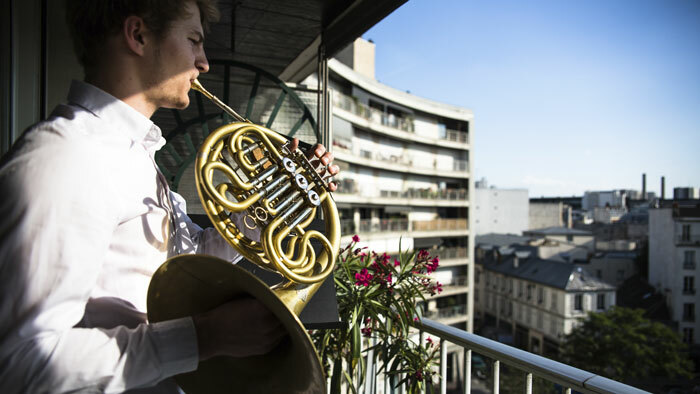 Music from classical instruments connects with noises, sounds and conversations between people who live in the building. In Graz the production has been developed through collaboration with 44 members from the Philharmonisches Orchester Graz. Pierre Sauvageot : composition, Jany Jérémie : spatial installation, Nadine Estève : scores, Guillaume Bonnet : musical computing, Josëf Amerveil : sounds collect, Marcus Merkel : orchestra rehearsal, Elodie Sannier : production, Alexandra Pax : general managing, Drazan Kuvac : sound production. With the complicit ears of Roland Hayrabédian, conductor of Musicatreize, Philippe Carrese, director and author. Grand Ensemble is a production of Lieux publics, European pole and national centre for artistic creation in public space, presented in Graz in collaboration with the Philharmonisches Orchester Graz, with the support of IN SITU platform, in the frame of the ACT project, co-funded by the Creative Europe Programme of the European Union.